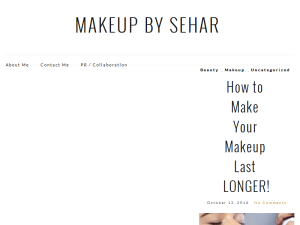 This what your Makeup By Sehar Blog Ad will look like to visitors! Of course you will want to use keywords and ad targeting to get the most out of your ad campaign! So purchase an ad space today before there all gone! Huda just release sneak peak of the New Huda Beauty Desert Dusk Eyeshadow palette and the internet is freaking out. The looks created look amazing! Who else is excited? Pictures are taken from Huda Beauty blog and Instagram page. Hope you are well. In today’s beauty game. BROWS. ARE. EVERYTHING! My brow hair grows back so fast, I used to get my brows done every week. It also didn’t help that I was shaping them much thinner than their natural shape so it used to look awful when the hair started growing back. However, in the past year or so, thanks to Instagram, I have had a new love for my fuller brows. I started growing them using homemade remedies and doing them my self. I honest didn’t know how important good tweezers and good brow products was until I started doing my brows at home. I remember a period that I went through 5 tweezers because I couldn’t find one that grabbed onto my short brow hair properly. I almost gave up on finding ‘The Perfect Tweezer’ until one day I was shopping at Sephora and I discovered Tweezerman. I was a bit hesitant at first because I thought it was a little expensive. But I eventually gave in when I was in the check out line and couldn’t stop thinking about purchasing it. I bought the stainless steel slant tweezer. BEST DECISION EVER! They are completely worth the price and last forever! It honestly changed my brow game. I was became obsessed! I even bought a smaller pair to keep in my purse (yes I’m that girl) The tweezers were so good, it grabbed even the smallest of hair and I was able to pull it out without breaking it. After I purchased my first pair, I did a little research on the company and it became clear why the products were so good. It’s parent company was the maker of Zwilling J.A. Henckels knifes. If you are into purchasing high quality house ware you probably own a Zwilling product. They are well known for their high quality steel and sharp long lasting blades. Couple of my favorite products from them are in their Rose Gold Collection. How beautiful are these!! Here is a before picture of my skinny brows. Here is a more recent picture of my brows. Tweezerman is so under rated. I don’t know why every beauty blogger doesn’t talk about them. Every product I’ve tried, I’ve loved. Including their lash curler and brow shaping brush. These are direct links, I don’t make a commission on them. I do sometimes get PR from Tweezerman but all opinions are my own. I am in no obligation to talk about them or give them a positive review. Since I started blogging again. I wanted to share a few of my favorite products with everyone! The Hydraluron line from Indeed Labs. You can check out my previous blogs for full review. The Hydraluron helps boosts moisture in your skin while making it smooth, plump and soft. The Hydraluron is my go to moisture jelly. For full details of the giveaway you can check out my Instagram Post. The products were donated by Indeed Labs for this giveaway. If you are the owner of Makeup By Sehar, or someone who enjoys this blog why not upgrade it to a Featured Listing or Permanent Listing?